Not many people know much about LA Unified’s $133 million MiSiS computer system that has held the center of attention for the past year—and will determine the success or failure of the school year now underway. District officials this week gave LA School Report a behind-the-scenes look at the system to understand what it does and how it works. 1. Everything is stored in a Hewlett-Packard black box, larger than a coffin, on the 9th floor of the district’s downtown Beaudry headquarters. 2. The black box is a state-of-the-art memory system known as “DragonHawk,” and this latest version was installed in May. 3. The temperature of the room is set at very cool 69 degrees, but if temperatures rise to 85 or above, or if the power goes out, two back-up generators keep the system cool enough to prevent burnout. 4. At the moment there is no DR (Disaster Recovery) site if something were to happen to the black box. A separate site is being built in Van Nuys, but it will not be ready until next year. 5. The entire school system and its data goes through this 240-core-server and feeds to 23 web servers. 6. This is the largest system of its kind built for Windows 2012. The red light warning system sits in the middle of the techs. 7. Last year’s black box failure was the largest system of its kind at the time (this one is bigger) to fail. The older version could not handle the code, and it was the inefficiency of that code that created last year’s problems. 8. The district will be getting rid of all the old servers this year. 9. A team of Microsoft employees from all over the country is rewriting the coding for MiSiS on the 10th floor, right above the black box. 10. 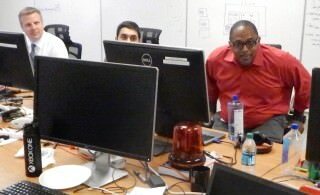 The Microsoft employees sit around a red light that will go off like an alarm if the “build” of the MiSiS system fails. 11. It has been “a long time” (a few months) since that red light went off.